Since it was cold and drizzly it was a quick sprint outside to pick something to use for joining in with Julie’s ‘In a Vase on Monday’ meme today. At this time of year I can always find some bergenia flowers in my garden. 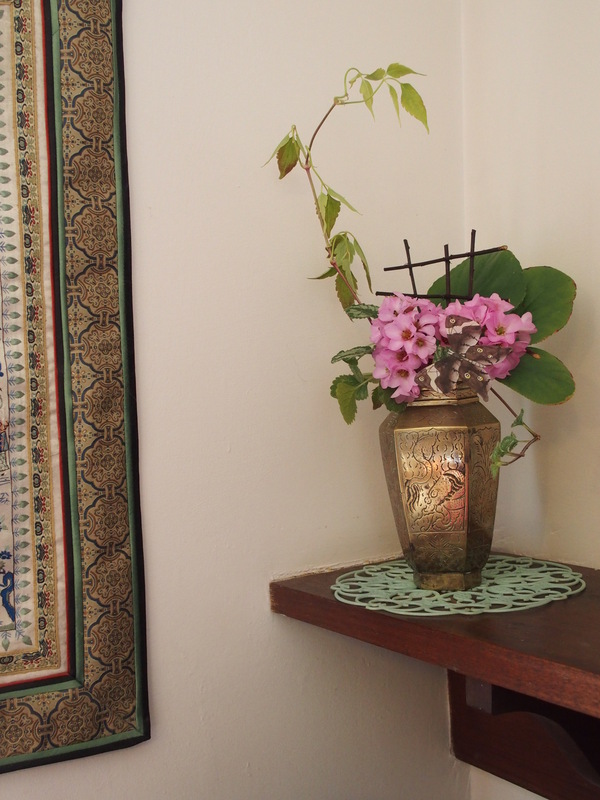 I chose an old brass vase which I don’t usually use for fresh flowers and its oriental style has influenced the style of the arrangement. 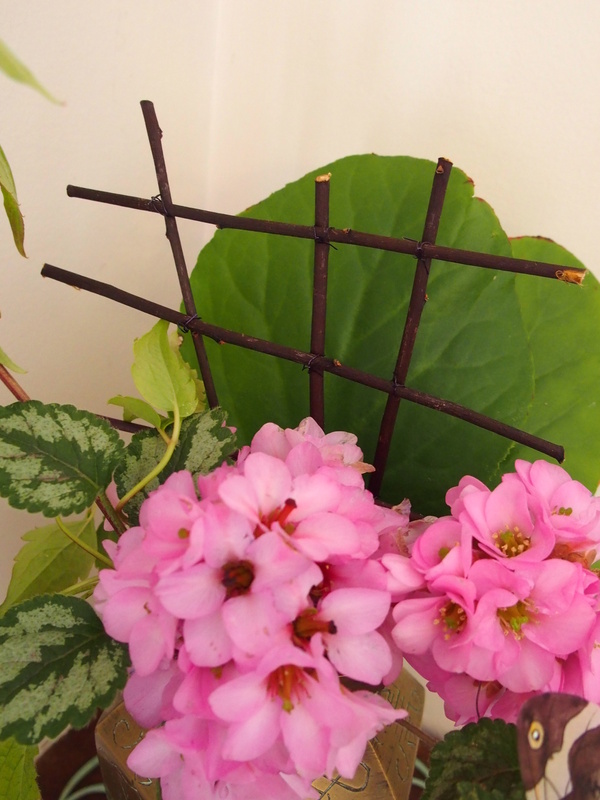 The plum sticks I used in my ‘String of Pearls’ vase have dried nicely (as have the rowan berries) so I decided to make a lattice like element with them. Combined with the bergenia flowers are three bergenia leaves in graduating sizes, a piece of clematis vine and a sprig of a variegated ground cover that no matter how much time I spend pulling it out of the garden it persists! I have also added one of my silk butterflies – you can see how I’ve used them before in my post Butterfly Wings & Other Things. I have photographed it in the corner of the fireplace bookshelf near a lovely embroidered panel my sister bought me on a trip to China, it’s not a spot I usually sit a vase but it works rather well so perhaps it’s time to rearrange a few things. I have made several dresses for My Garden Fairy using bergenia flowers that you can see here and here . Thank you, that’s what happens when you type in a hurry I’ll fix the link. Oh my! that is beautiful! 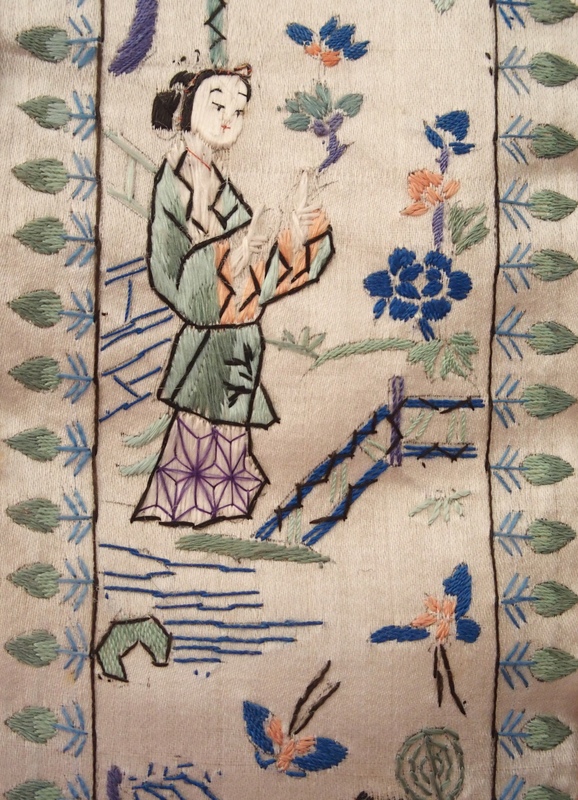 Calming and sits so well with the embroidery. Thank You! I love your petite teacup arrangement. 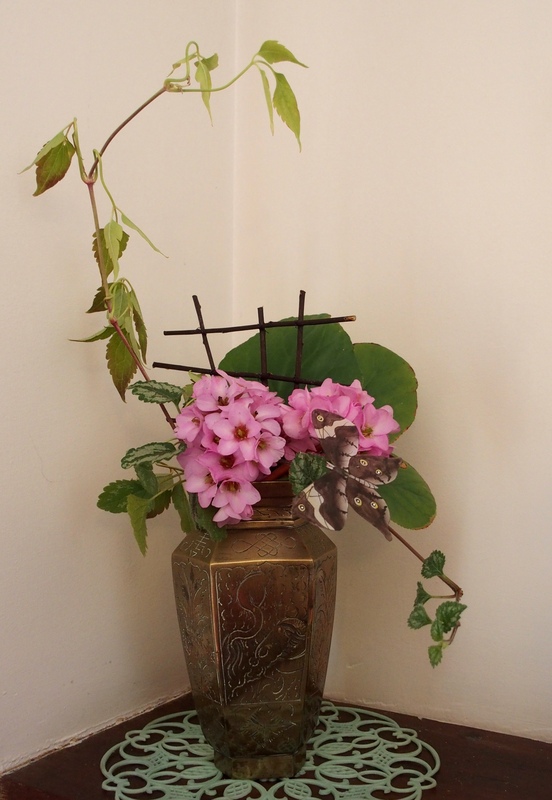 I adore this brass vase…the bergenia is perfect along with the twigs and foliage….a beautiful display! Thanks Donna, the brass vase is one of two I have – I think they were originally my grandmothers. The other is a completely different shape with a narrow fluted neck – I’ll have to have a go using it too. A very pretty and elegant arrangement – the bergenia looks very much like hydrangea flowers when cut for a vase. Thanks Julie and yes they do. I loved your pink and proud! You are so gifted – a beautiful and delicate arrangement!